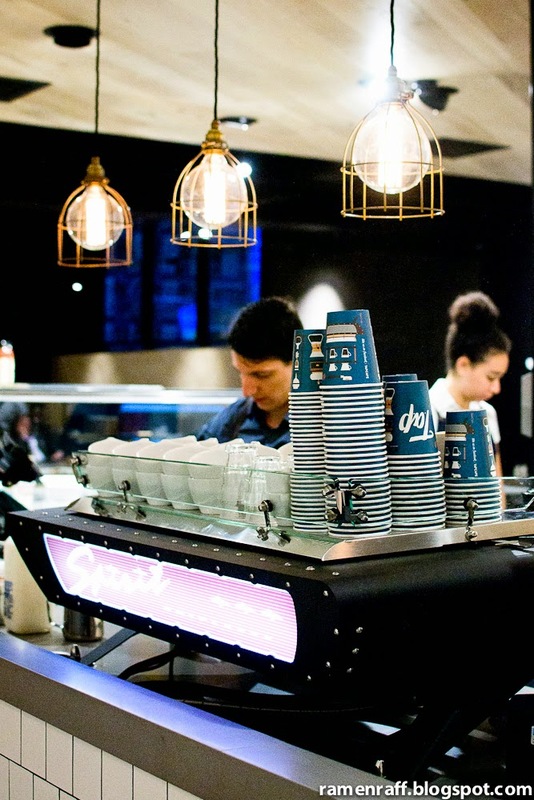 I'm so stoked to see more specialty coffee places opening in Sydney CBD. 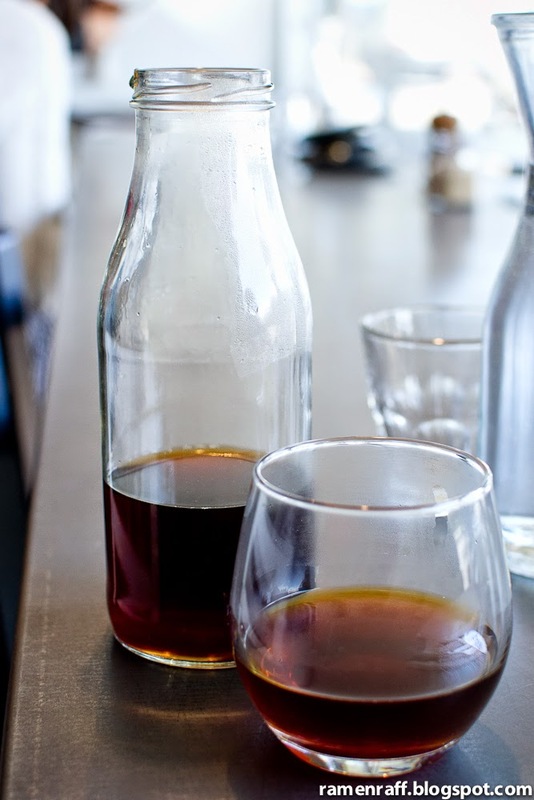 There's more to coffee than just flat whites and cappuccinos. 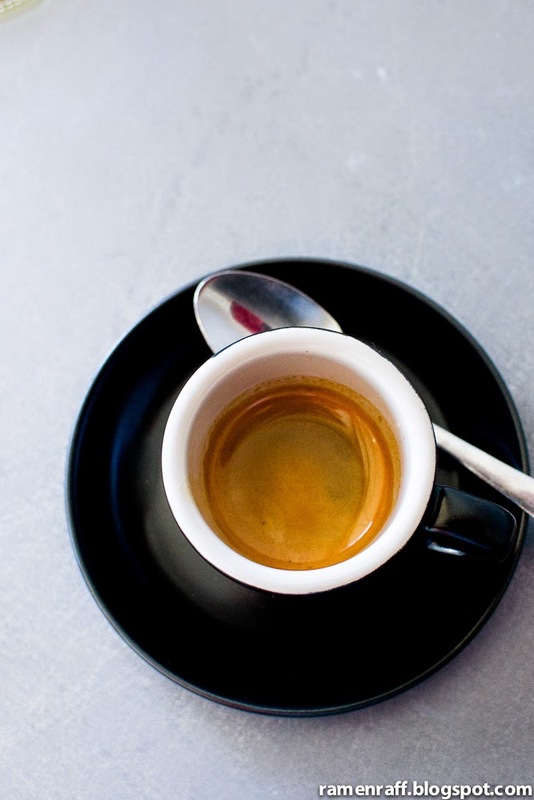 It's good to mix it up a bit with different single origin espressos and filters every now and then. According to American author, Bryant McGill: "Life wants you to touch, taste and see the grandeur of the world's unfathomable variety". It seems like Joe Musumeci tapped into that quote and opened Tap Espresso. 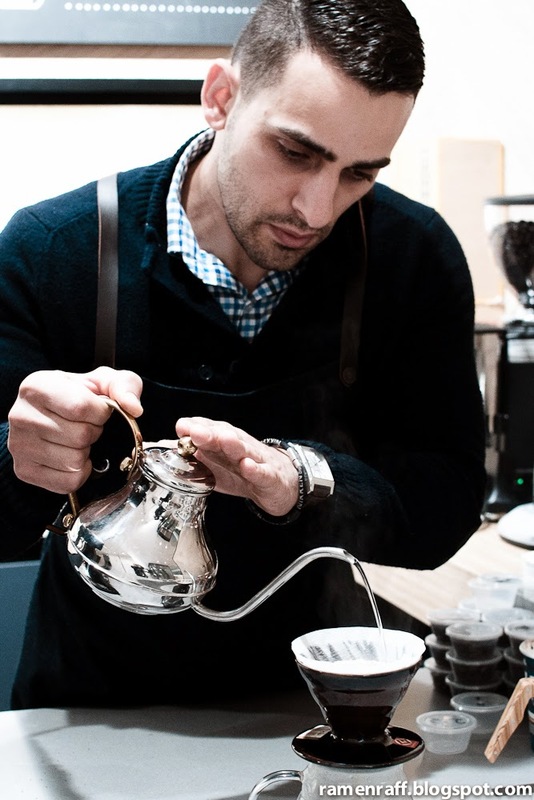 Joe (former head barista at Bond Cafe) is the owner and head barista of the new Tap Espresso. 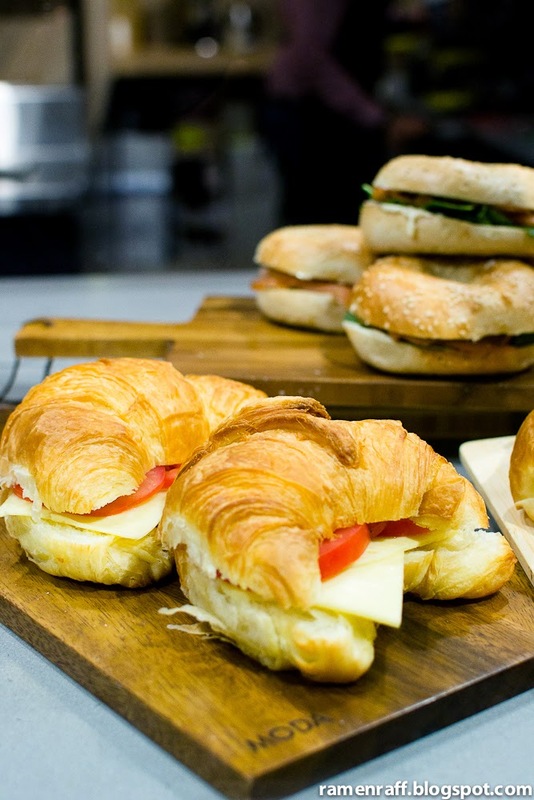 It is conveniently located inside the same building as Channel 7 and right above the Martin Place train station. Coffee is his passion, which means that the process from beans to cup is executed with precision. He even got Toufik (formerly from Circa Espresso) on board as barista and right hand man to ensure that customers get the best possible coffee everytime. 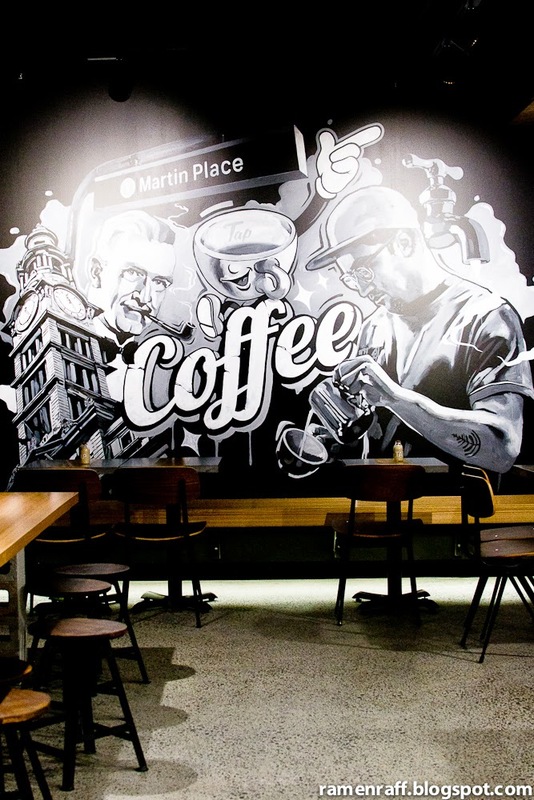 Tap has a very chilled vibe, a contemporary cafe look with industrial fittings and a badass street art mural. 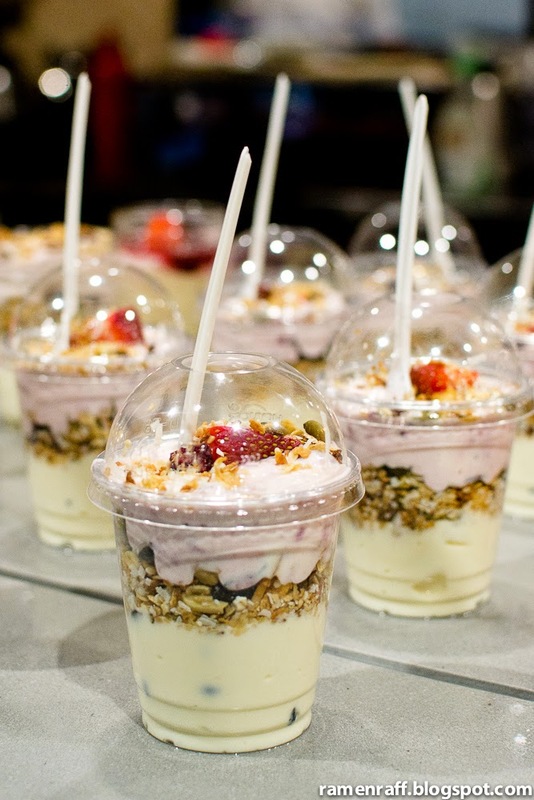 Sliders, toasts, and yoghurt parfaits are available for breakfast. 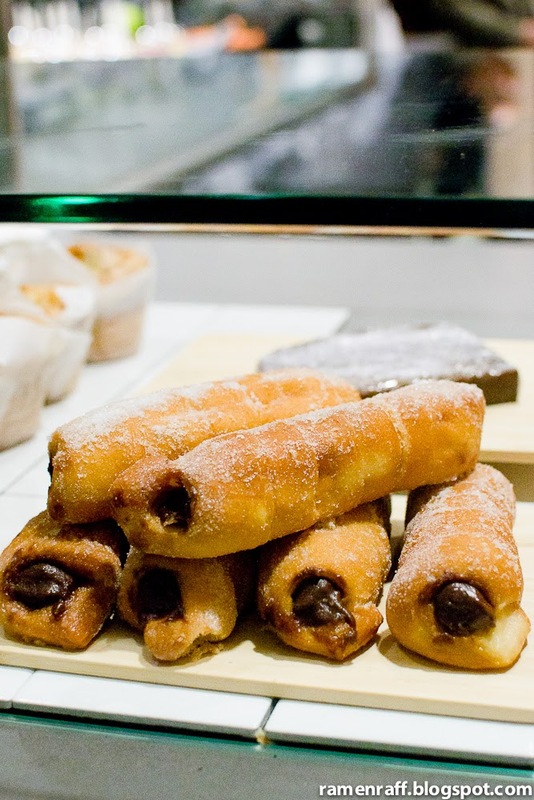 They also have sweets and pastries available. 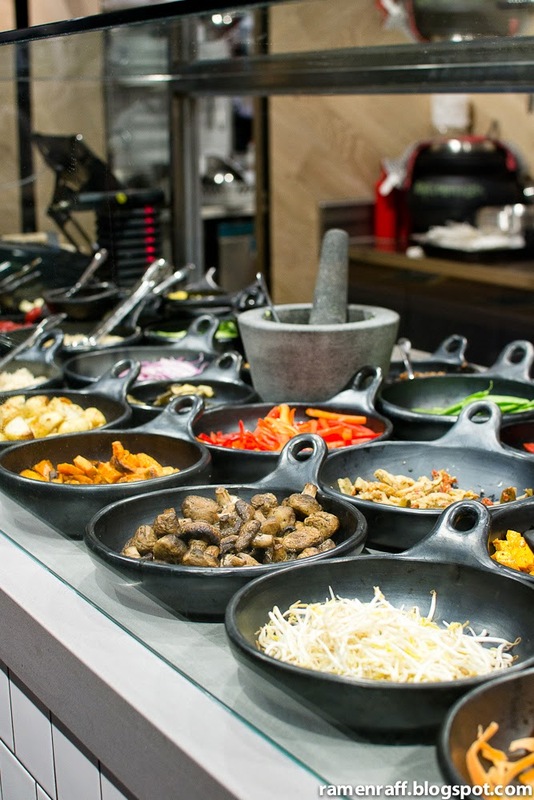 For lunch, there's a DIY salad bar and pita wraps. 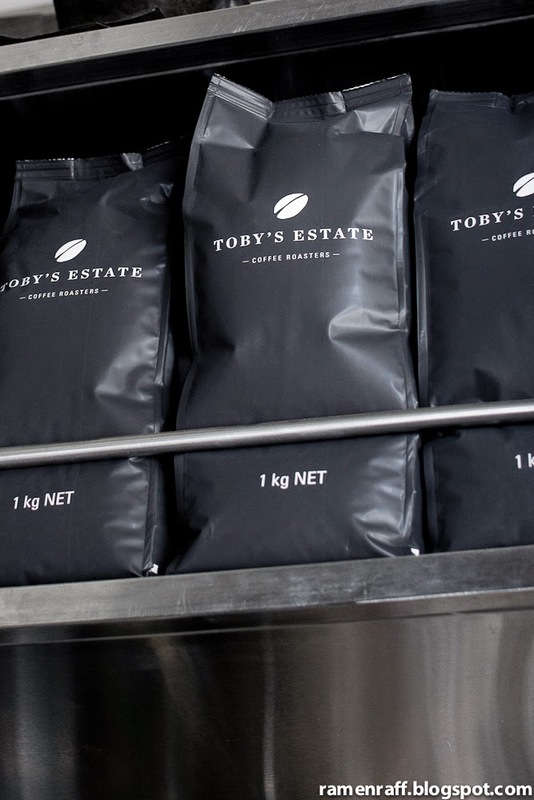 Besides the house blend, which is custom roasted for them by Toby's Estate, they also have guest blends and single origin beans from other roasters. 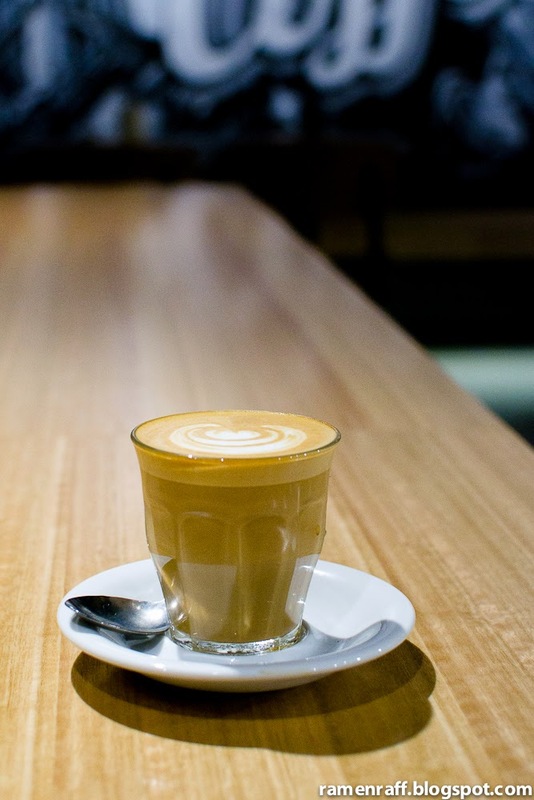 Blends and single origin beans from Mecca, Ona Coffee, Circa and Reuben hills have made appearances in the last few weeks. 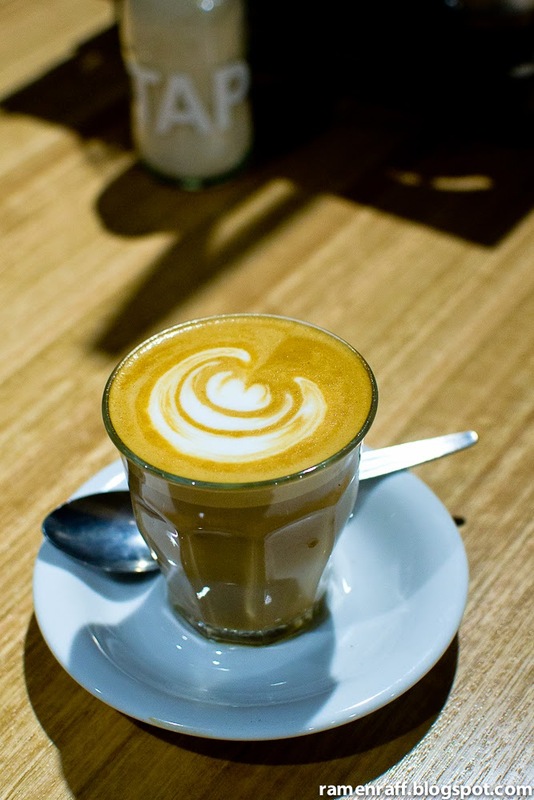 The Tap espresso house blend in a piccolo latte ($3.50) came out sweet and nutty with notes of milk chocolate and hazelnut. The milk was textured nicely and had a perfect temperature. 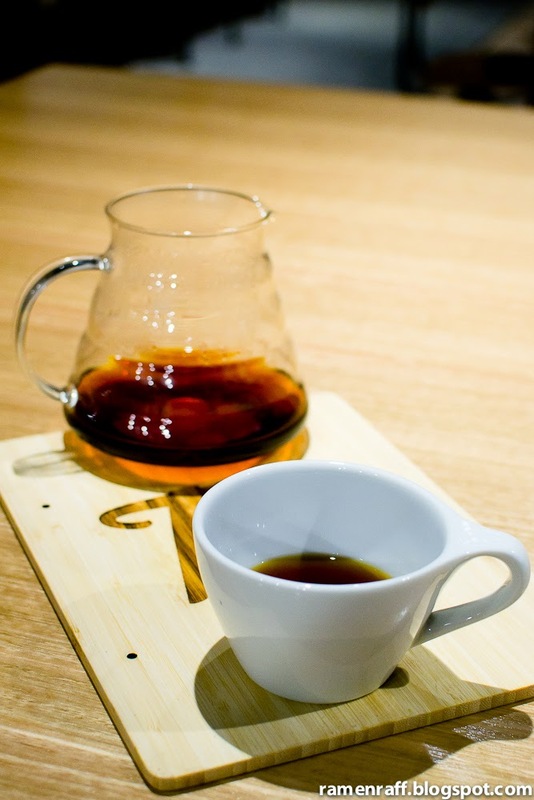 For filter, I had a Panama Finca Santa Teresa Gesha ($6.5) from Toby's Estate. I loved the delicate sweet flavour and notes of jasmine of this coffee. 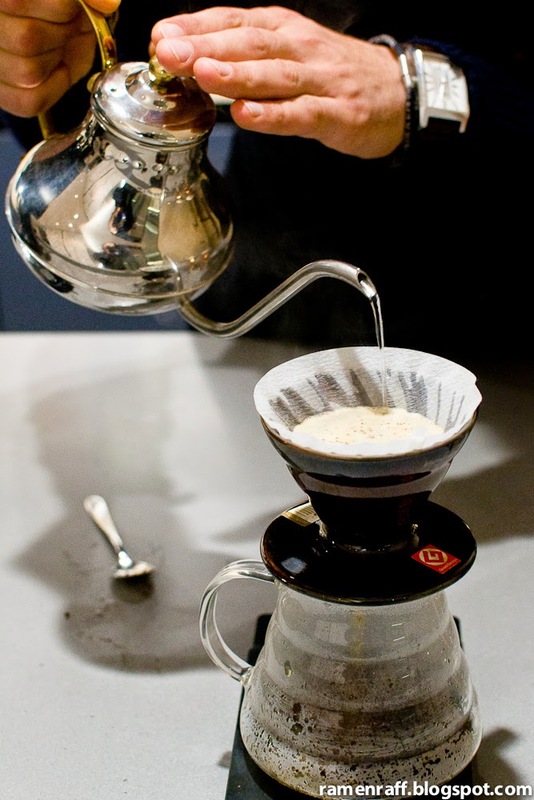 I gotta give props to Toufik for his mad pour over skills. The flavours came through with nice vibrance. I also had a Ethiopia Lelisa Hara roasted by Reuben Hills on Filter ($4.5). It was fruity with notes of cocoa. 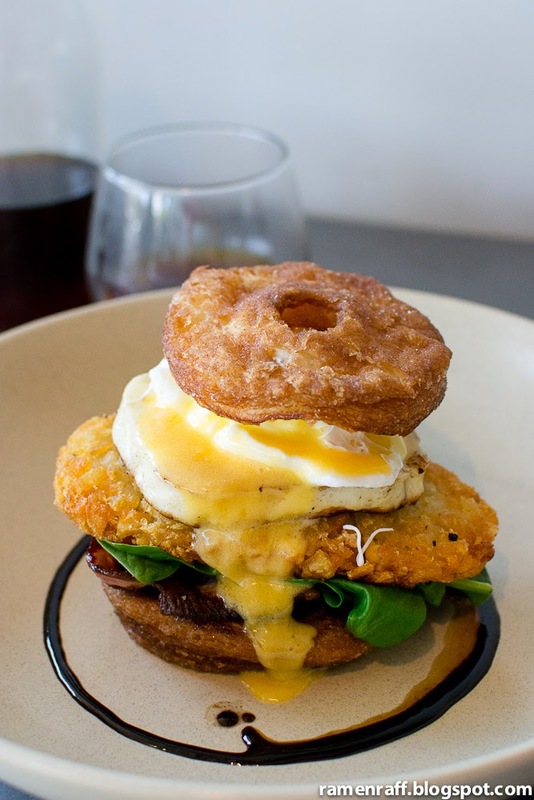 Their breakfast slider ($8) was totally awesome. It's bigger than a slider and more like a roll. The creaminess from the avocado and piquant Swiss cheese was so nice on the palate. The crispy prosciutto was buttery and sweet with a hint of salty flavour at the end. The tomato relish gave it a nice sweet and sour balance. 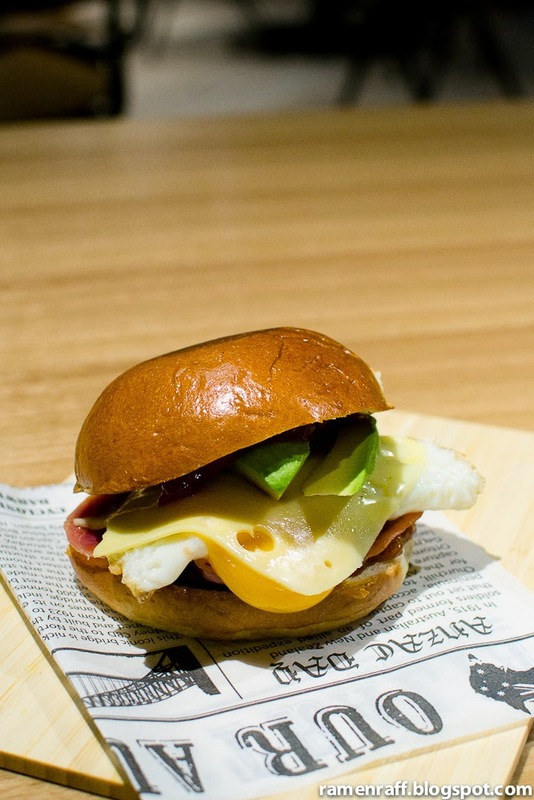 The sunny egg with runny yolk added extra richness to the slider. A soft sweet buns is used for the slider. 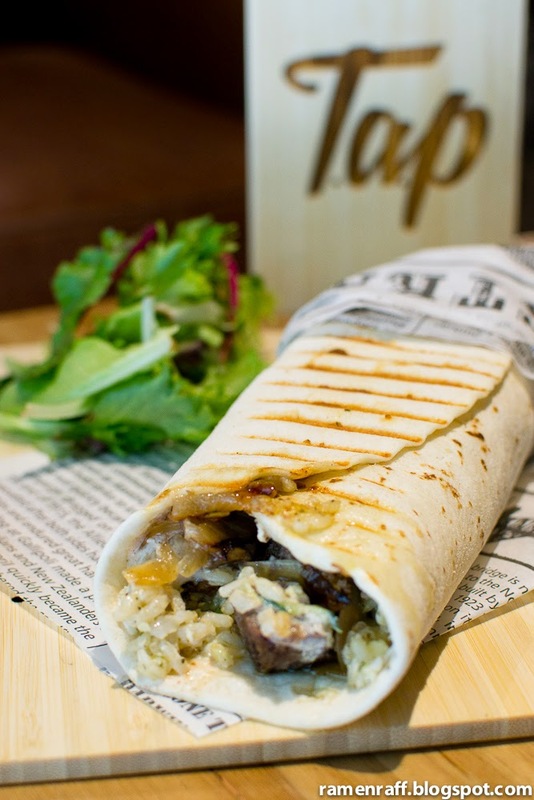 The lamb pita wrap ($11) was like a Greek burrito. It had glorious tender slow roast shish lamb, Aegean salad, caramelised onion and tzatziki. The tangy and garlic flavours of the tzatziki as most of us know compliments lamb perfectly. The sweetness from the caramelised onion, the texture (the rice component in particular) and citrus/sour flavours from the Aegean salad completes the pita wrap. 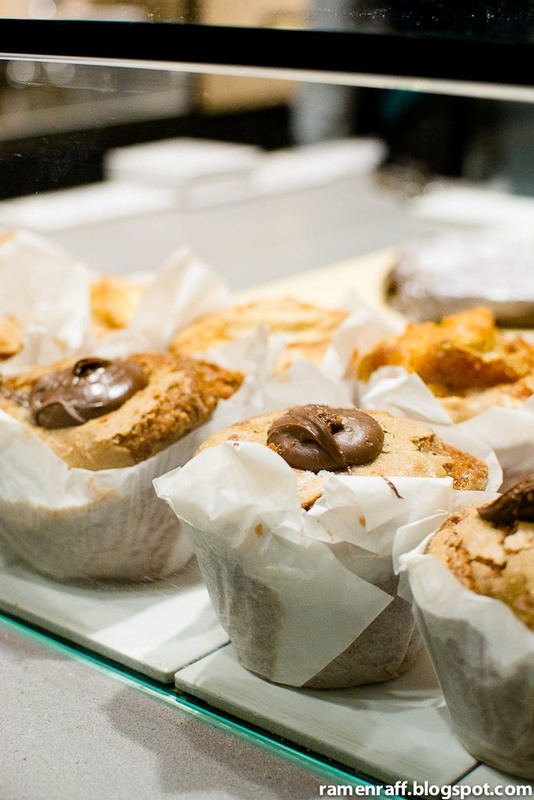 The variety that Tap Espresso has brought made work days more exciting in the area. The service is superb, food is delicious, and the coffee is spot on. 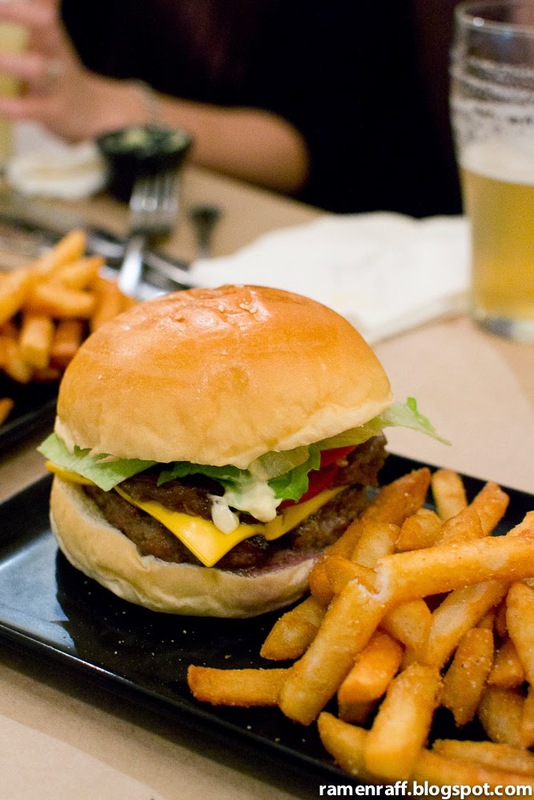 Sydney has an aBUNdance of excellent burger places. 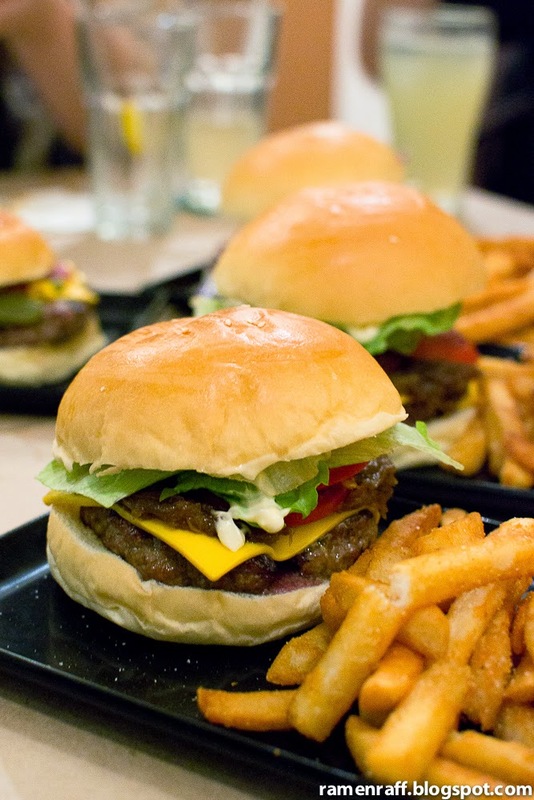 Areas like the CBD, Potts Point, Newtown, Coogee, Surry Hills and even the Northwest suburb of Glenhaven have been serving us up with flippin' amazing burgers. 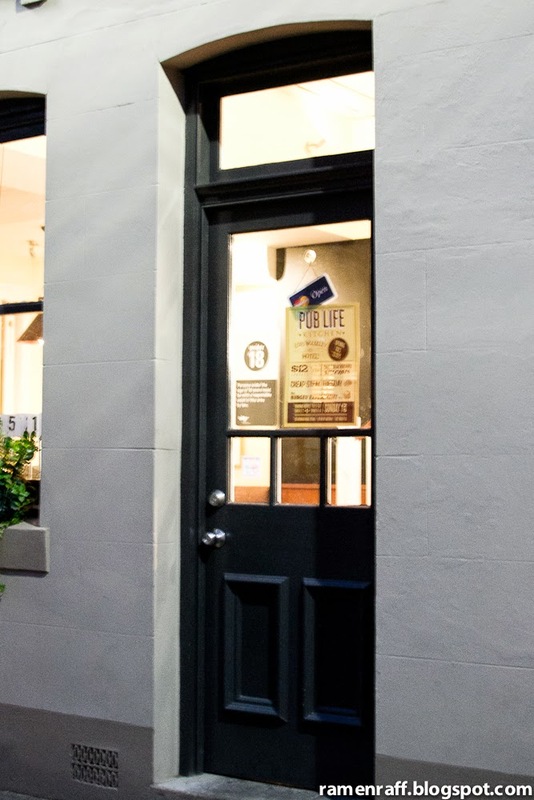 Now, Ultimo has joined the line-up with the Pub Life Kitchen. 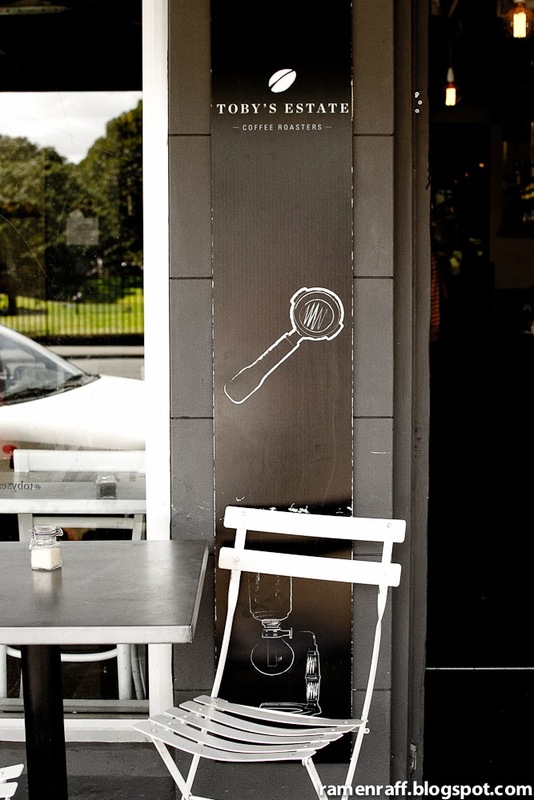 Some of you may remember them from their old spot on Wentworth Avenue, Surry Hills. 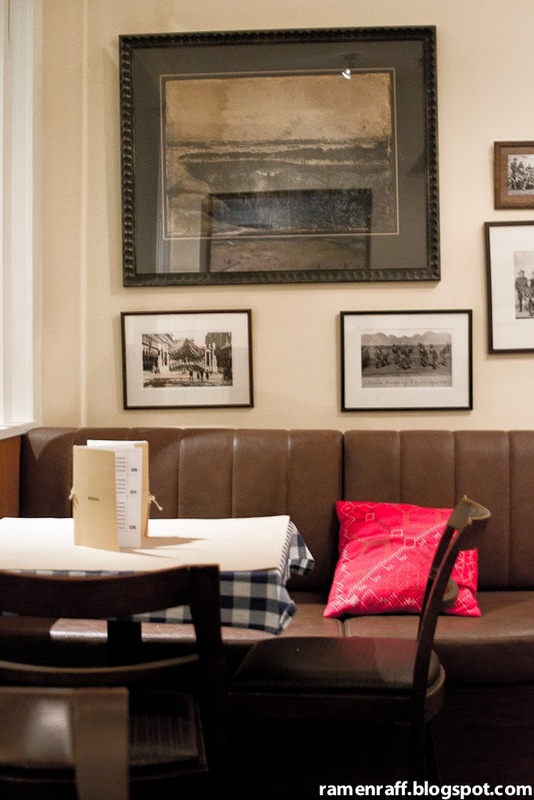 After a few pop-ups in the last year, they have recently made The Lord Wolseley Hotel in Ultimo their new home. 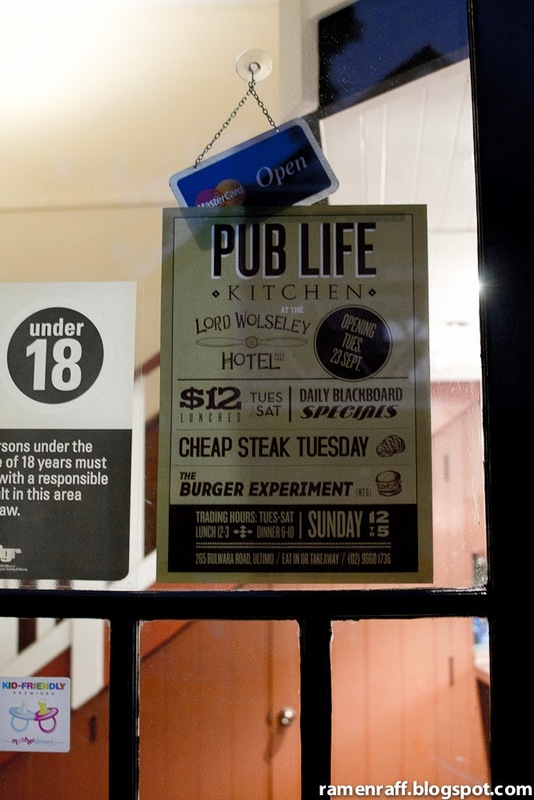 Pub Life Kitchen's new space has a mixture of vintage and diner look. I've read about their delicious creations through a few blogs back in 2012 and have been following Pub Life's footsteps ever since. 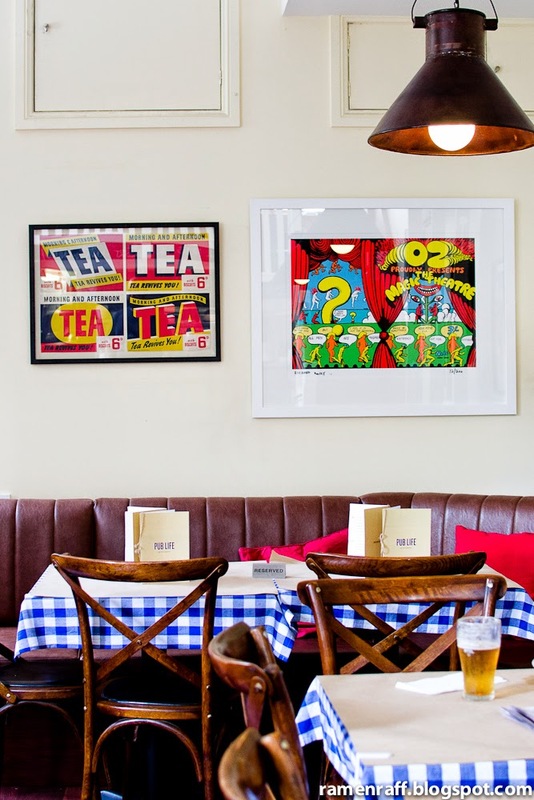 They serve pub staples like chips with gravy, schnitzels, steak & chips and burgers (or BRGRS as they call them). Some items are kept classic and others are served with a twist. I finally got to try what the Pub Life has to offer, thanks to the food loving people that I got to dine with. We were all united by a common goal: to eat ALL the burgers! 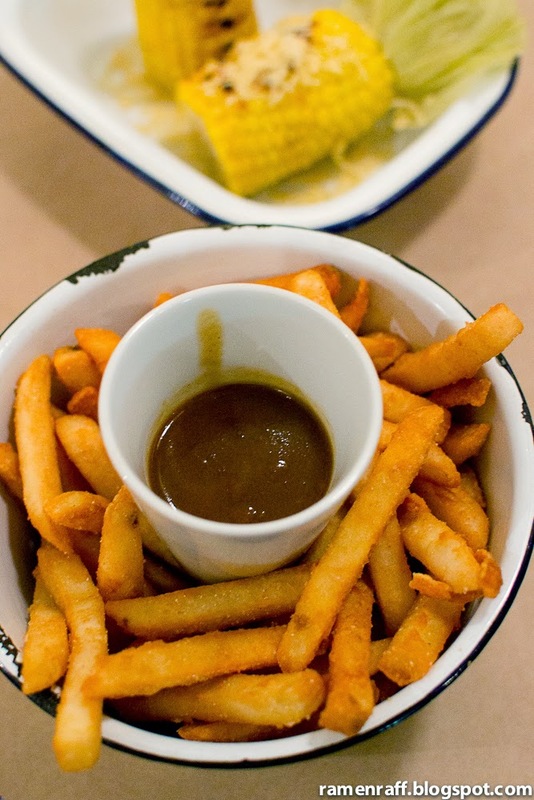 We started with some fries with bone marrow gravy ($8). The fries were perfectly crisped and seasoned. The bone marrow gravy was next level in taste! The bone marrow made the gravy extra buttery and sweet. 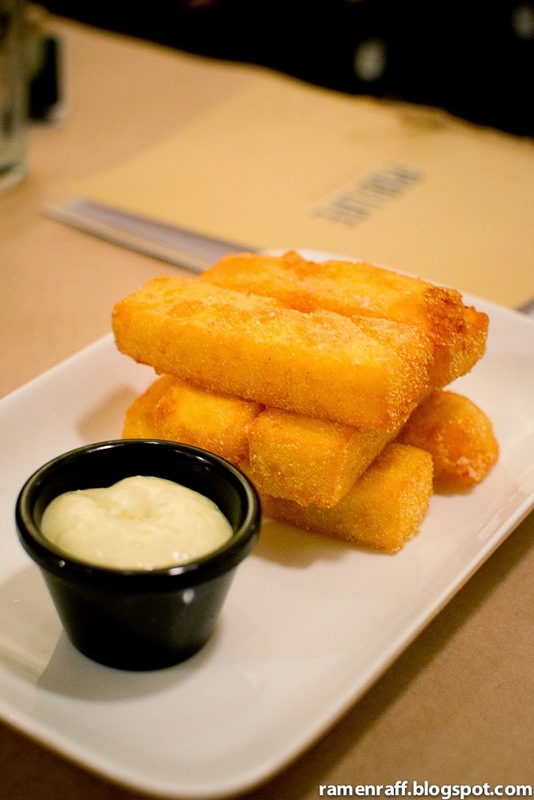 The cheesey polenta chips with jalapeno mayo ($8) was logs of happiness with fluffiness. It was lightly crisped on the outside while being fluffy inside almost like a firm scrambled egg texture with cheesy flavour. 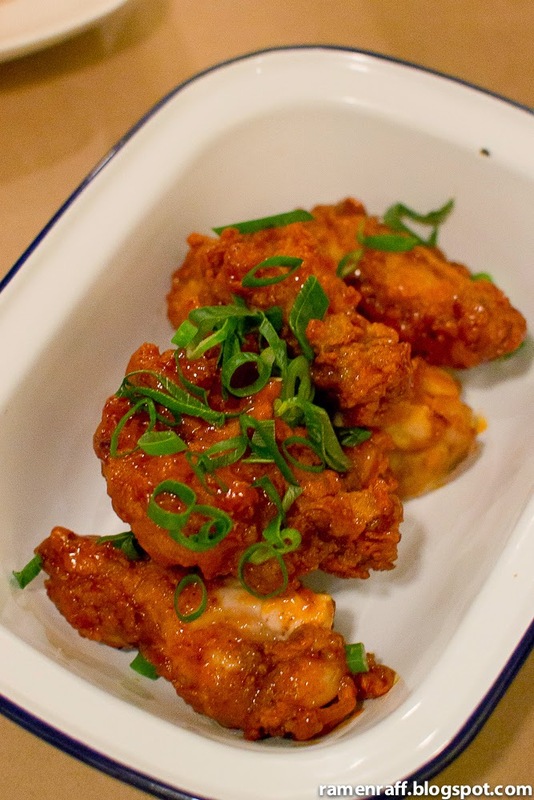 The sticky hot wangs ($9) are deep fried chicken wings that are quite similar to buffalo wings. The sticky hot wangs though had less heat and more sweetness. The batter coating was crunchy and the rippley texture was a nice contrast to the sauce. I also loved the notes of cayenne pepper in the sticky hot sauce. 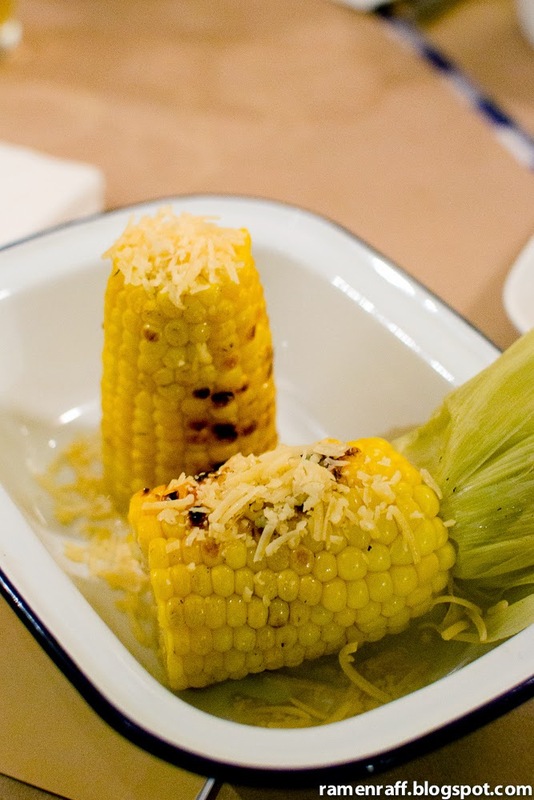 The grilled corn cob with salty lime malt vinaigrette ($6) was a smokin' top snack. It really did have a smoky flavour that may have been the result of the grilling and the salty lime malt vinaigrette. 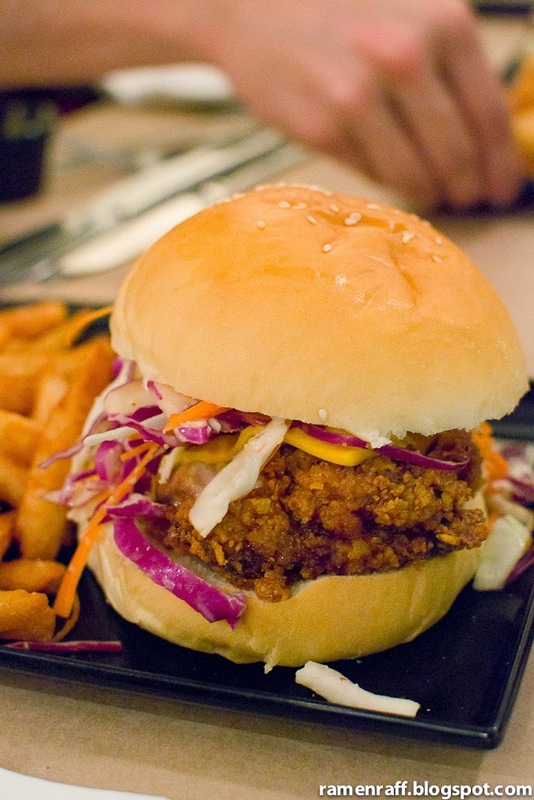 The Bird burger ($18) had dorito fried chicken, jack cheese, slaw and mayo in a soft sweet bun. The chicken was juicy and the golden batter coating had a nice crunch. The slaw and mayo went well with the chicken in terms or texture and flavours. The O.G. 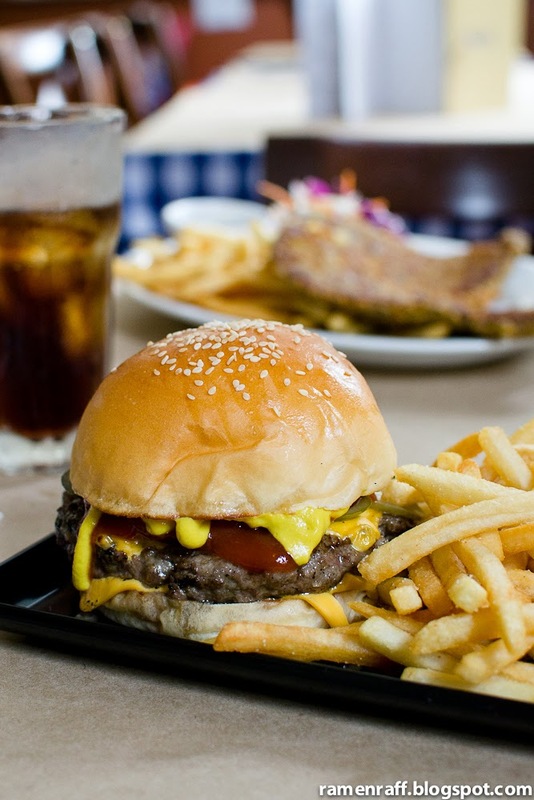 ($18) burger is the Original Gangsta indeed! It had medium rare beef patty, jack cheese, salad, onion jam, roast garlic and lime aioli in a soft sweet bun. Though the sweetness of the onion jam can be the dominant flavour at times, the whole burger was still overall badass! But it was the cheeseburger ($17) that swooned me. It was classic and simply perfect! It had housemade beef patty, double jack cheese, pickles, onion, tomato sauce and mustard. The tasty patty was cooked medium rare and seasoned well. There's just something magical from the simple mixture of tomato sauce the zingy mustard. The sweet and sour flavours from the pickles and red onions balances out the burger. Team Pub Life Kitchen knows how to bring the best out of pub and diner staples. They can keep it beautifully simple or take a classic to the next level. I will definitely be back for more of that Pub Life Kitchen flava. I've been a fan of Toby Smith and his team's coffee roasting skills for many years now. 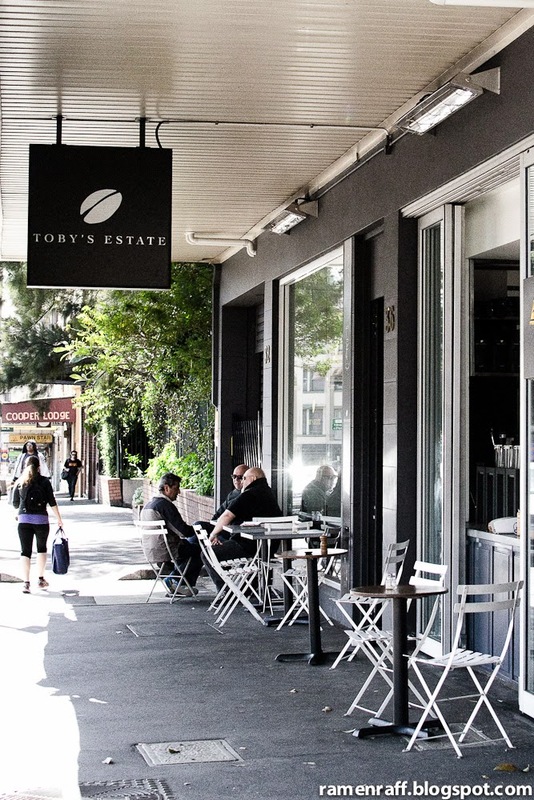 I've also looked up to talented baristas in Sydney and many of them have trained or worked for Toby's Estate. It's not a surprise as the founder Toby Smith and his business partners are all about the pursuit of the best quality specialty coffee. 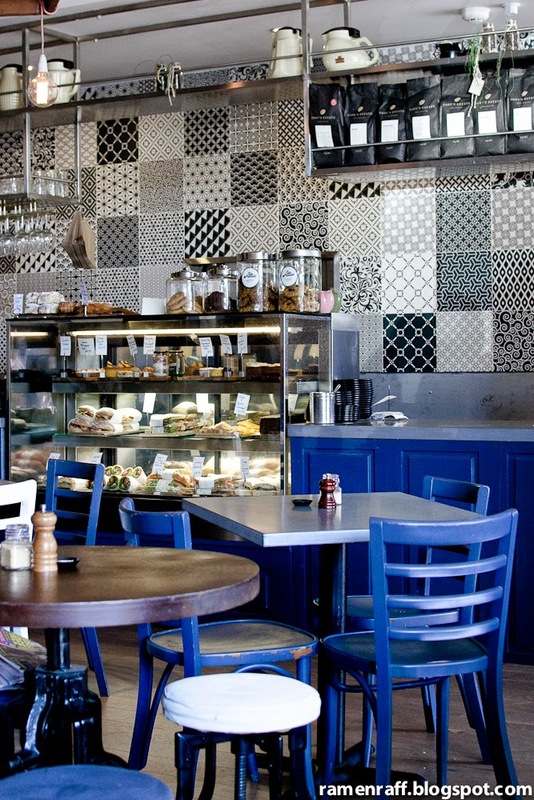 Their Chippendale cafe located at their main hub on City Road has recently gone through renovations. I was in the area last Saturday and thought I should pay them a visit. 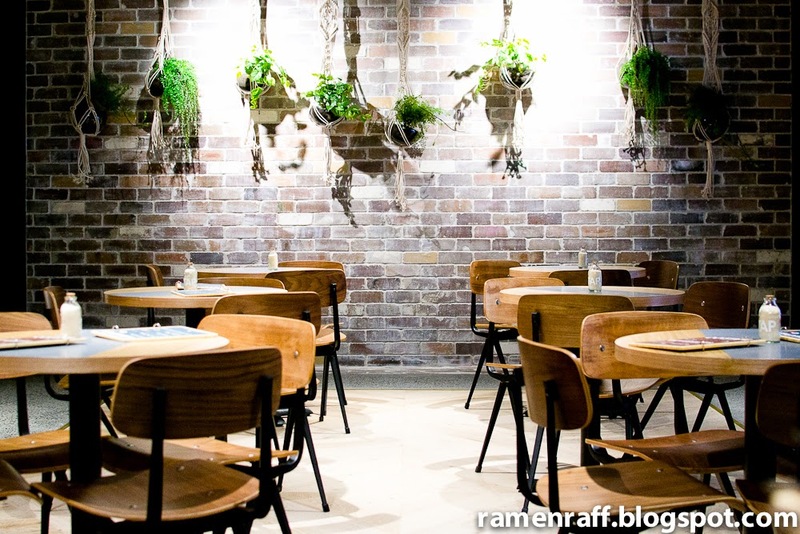 The space had a homey modern Scandinavian look with a touch of industrial fittings. The sight of bags of coffee beans, food and the scent of coffee aromas were so enticing that it filled my heart with excitement. I felt like giving everyone a high five and so I did (only in mind though, to the song "Happy" by Pharrell). 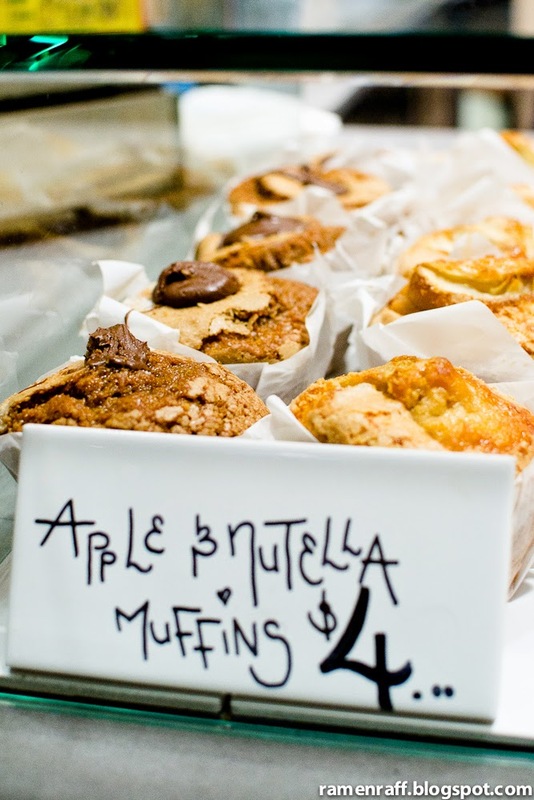 The menu consisted of sandwiches and creative modern Australian cafe dishes. One of the first things I noticed before entering the premises was the Brewtown brewnuts ($5 each). Did y'all know that Simon and Charles of Brewtown met while working at Toby's many years ago? I started the visit with a beautiful filter coffee from Kenya Inoi. It had a nice peach acidity with notes of cocoa and almond. There was also faint notes of currant at the back of the palate. I was given a complimentary short black of Panama Santa Teresa La Cabana Gesha which was roasted for espresso! Yes, you read that right! 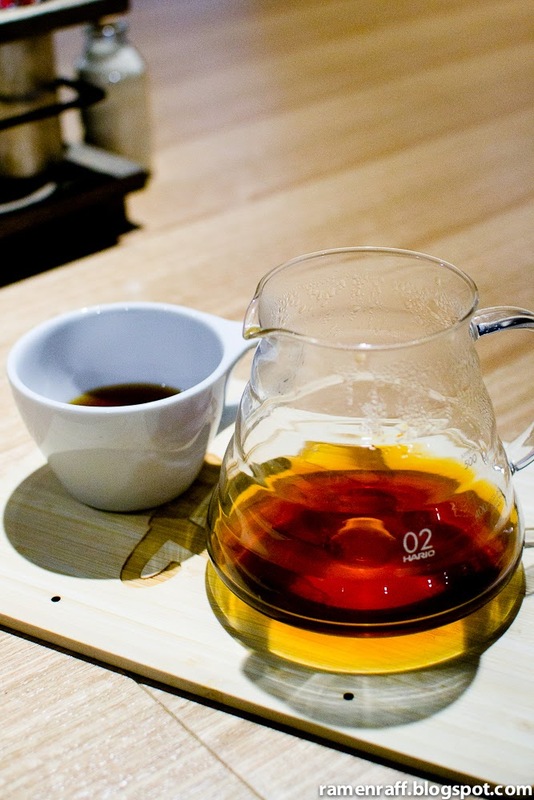 It was the first time I've heard or tried a Gesha that's not roasted for filter. It was so gorgeous! 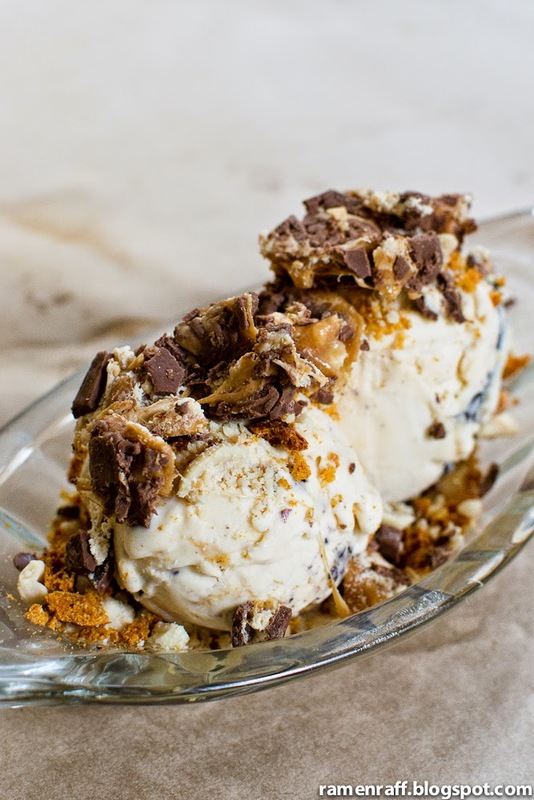 It had toffee & floral aromas. It was sweet on the palate and it had a medium acidity level. It also had fruity, honeysuckle & jasmine notes. Last but not least was a special that I hope they keep as a regular in the menu. 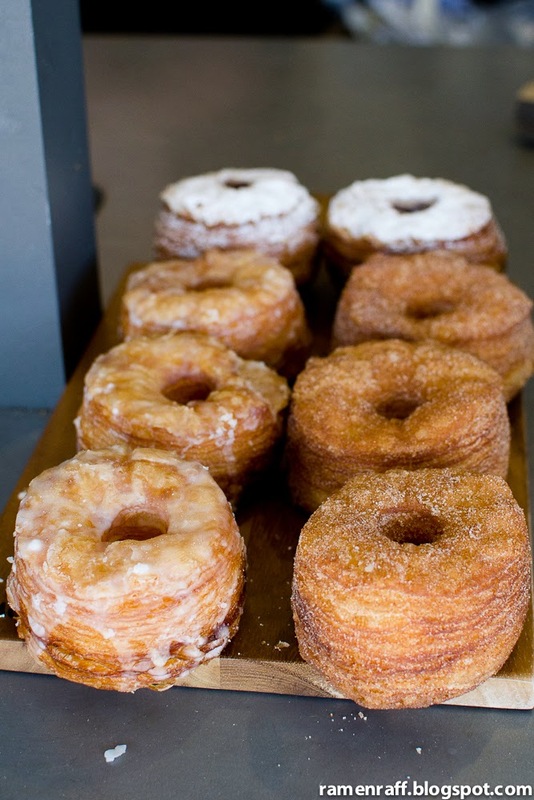 Ladies and gentlemen, I introduce you to "The Cronut Stack"($16.50). 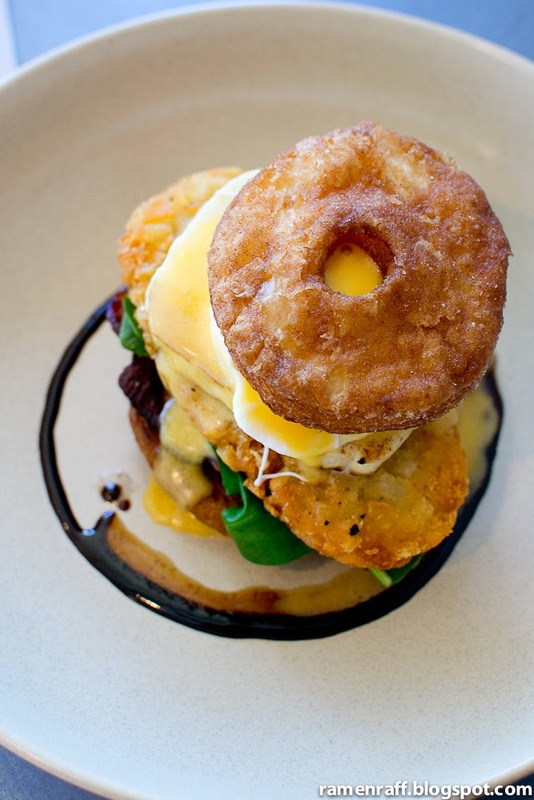 It consists of cinnamon sugar brewnut, poached egg, grilled haloumi, hash brown, spinach and bacon with hollandaise sauce. This is one of the most glorious things I've had in my life. As expected from an organisation that owns and runs a coffee farm, coffee school, roastery and cafes (in Australia and overseas! ), everything was top notch. The service, coffee and food was nothing short of excellent.